Midwest Floods and Unjustified Climate Change Fear Mongering | Watts Up With That? A guest post by Mike Smith, CCM and AMS Fellow. The Midwest floods were rolling downstream last week, setting river stage records in Iowa, bursting levees on the Mississippi, and causing thousands to be displayed from their homes. Billions have been lost in damaged and destroyed property and 24 lives lost. The EDF proclaimed: Did Humans Cause the Midwest Flooding? In the piece, EDF’s James Wang writes, “Another element [of the Midwest floods] may be global warming, which increases the probability of extreme weather events like torrential rain.” NCDC, a part of the National Oceanic and Atmospheric Administration, headlined, Extreme Weather to Become More Common. The respective headlines can be found at http://environmentaldefenseblogs.org/climate411/ and www.noaa.gov/ . This is fear mongering, not the advancement of science. And, it detracts from NOAA as a whole because its National Weather Service performed heroically – with its field staff working long hours coping with the floods and accompanying tornadoes and severe thunderstorms. It is unseemly to work to score public relations points when people are losing their homes, their crops, and their lives. In explaining its contention EDF says, “Global warming intensifies the ‘hydrological cycle’ – the process in which water evaporates into the air, forms clouds, and then rains back down on the Earth.” While that contention that global warming intensifies the hydrologic cycle is itself speculative (for reasons outside the scope of this posting), the fact is a given tornado or rainstorm responds to weather, not climate, conditions. EDF author James Wang goes on to say, “Global warming doesn’t fully explain the catastrophe in the Midwest, but it likely [emphasis mine] plays a role.” The contention that “warming” is linked to catastrophic Midwest floods is relatively easy to test. Here’s how: What were the temperatures during this and similar floods in the region? As these figures demonstrate, lower tropospheric temperatures (the part of the atmosphere where weather is generated) have reverted to the levels of 11 years ago after a period of rapid cooling over the last year and a half. In addition to RSS, the other three measures of world temperatures reveal the same cooling pattern: http://www.woodfortrees.org/plot/hadcrut3vgl/from:1997/to:2009/offset:-0.146/plot/gistemp/from:1997/to:2009/offset:-0.238/plot/uah/from:1997/to:2009/plot/rss/from:1997/to:2009 . As Dr. Roger Pielke Sr. has previously discussed, the oceans (the more important indicator of global temperature change) have not been warming in recent years and have actually cooled slightly. The “warming” conditions explict in the EDF claim and implicit in the NOAA release do not exist. As a clue as to what temperature temperature pattern, if any, might really be associated this year’s floods, compare the temperature drop depicted on the RSS graph from January, 2007 to May, 2008 with the drop during months 150 to 170. 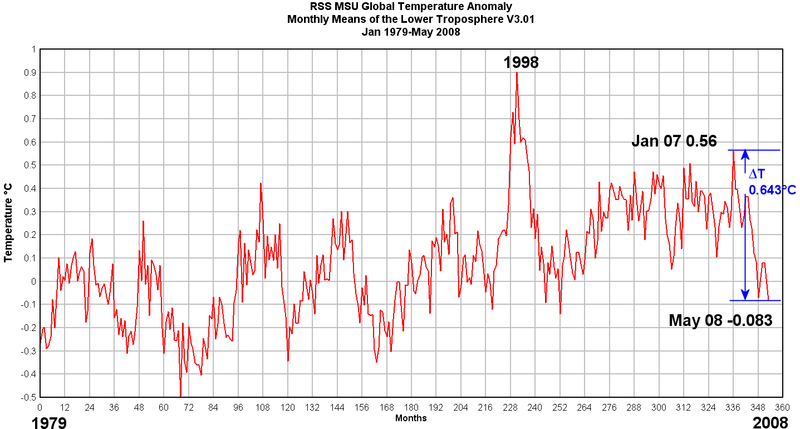 This cooling is widely attributed to the June, 1991, (month 149 on the graph) eruption of Mt. Pinatubo. That explosive volcanic eruption spread particulates into the stratopshere, shading the earth and cooling the lower atmosphere. A period of extremely heavy rains began in the Plains and Midwest in months 169 and 170 (depending on location) that lasted well into summer resulting in the Great Flood of 1993 in many of the same areas that were in flood last week. In both cases, temperatures were far lower than in the peak year of 1998. Why might Midwest flooding be linked to rapid cooling? Here is some “educated speculation”: Oceans lose heat more slowly than land. The Gulf of Mexico is the primary source of the low-level moisture that feeds weather and storms in the Midwest. A warm Gulf can provide large amounts of moisture. However, over North America, temperatures have been unusually cool (c.f., Anchorage sets record for latest ‘first 70° temperature’ of the year, story from June 20, 2008, https://wattsupwiththat.wordpress.com/2008/06/20/anchorage-sets-new-record-for-latest-high-temp-day/ ) and, from June 6, 2008 NCDC provides further evidence in its “U.S. 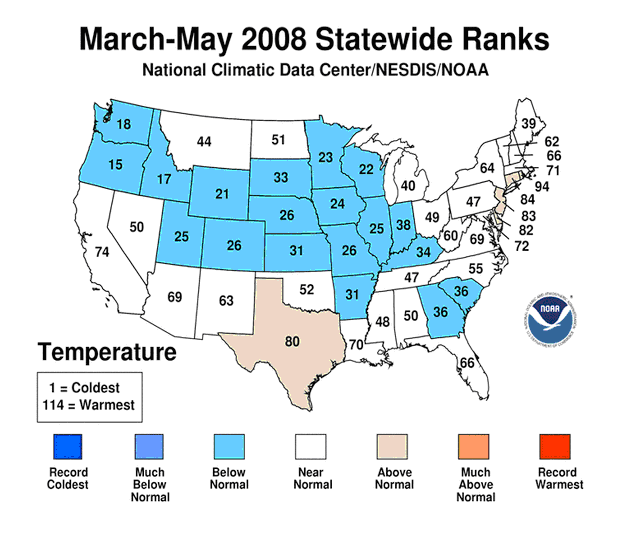 Has 36th Coolest Spring on Record” (www.noaanews.noaa.gov/stories2008/20080606_ncdcspring.html ). The accompanying map reveals the Midwest was colder than normal. By contrast, the Gulf Coast states were considerably warmer. Texas was warmer than normal with “normal” temperatures in Louisiana, Mississippi and Alabama. These states’ temperatures were strongly influenced by the warm Gulf air flowing over on them its way north to the Midwest. Basic meteorological principles indicate that persistent cold air to the west and north and warm, moist air to the south and east is a recipe for frequent intense thunderstorms. This pattern was certainly in evidence during spring 2008. The map accompanying NOAA press release shows this pattern in more detail: http://www.noaanews.noaa.gov/stories2008/images/03-05Statewidetrank_pg_final.gif . Higher numbers equal warmer temperatures. Note how it was warm in Louisiana (70th) and progressively cooler with each state to the north: Arkansas (31), Missouri (26), Iowa (24), and Minnesota (23). The Northwest was extremely cold with Oregon reporting the 15th coldest spring since records began. This is an ideal pattern for frequent thunderstorms with heavy rains. If last week’s Iowa flooding and world temperatures are linked in the way the EDF contends (i.e., higher world temperatures result in more Iowa flooding), there would have been record flooding in Iowa in 1998. While June, 1998 was wet in southern and eastern Iowa (www.cpc.noaa.gov/products/analysis_monitoring/regional_monitoring/palmer/1998/06-20-1998.gif ) major flooding approaching the scale of 1993 or 2008 did not occur. The record Midwest floods of 1993 and 2008 occurred after periods of rapid cooling. The warmest year, 1998, did not have Midwest floods anywhere near the magnitude of those in 1993 and 2008. It is my judgment the attempt to link the 2008 floods to Global “Warming” is completely unjustified. Mike Smith is a certified consulting meteorologist and a Fellow of the American Meteorological Society and the opinions stated above represent his personal point-of-view. He is CEO of WeatherData Services, Inc., an AccuWeather Company, based in Wichita. 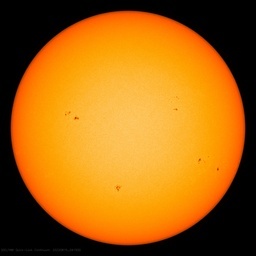 AccuWeather’s global warming blog can be viewed at: http://global-warming.accuweather.com/ . ← If Global Warming was a company decision, how would you vote? Humans did not cause the flooding rains. We did, however, make matters worse by building lots of stuff in a natural flood plain and then, thinking we could control nature, erected levees to keep the water out. Foolish is as foolish does. BTW, THAT’s WHY THEY CALL IT A FLOOD PLAIN!!! 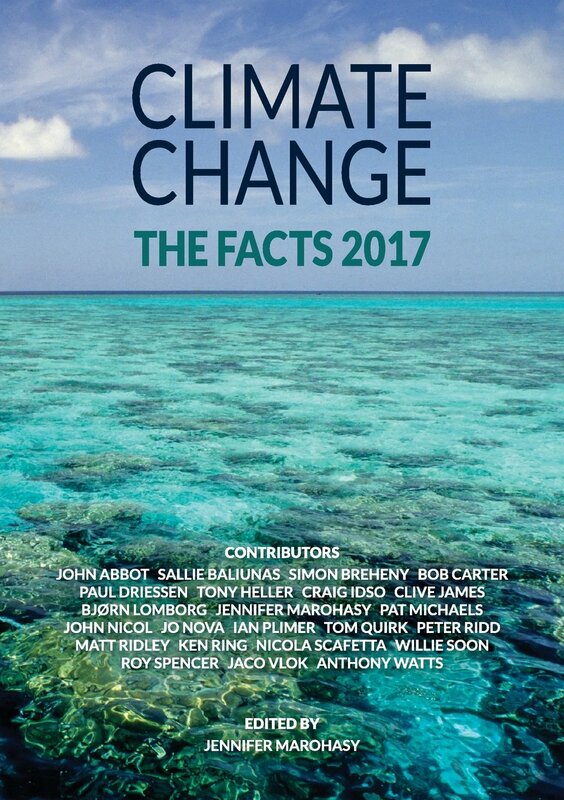 The sad thing is that, while the media trips all over themselves to report on any statement in support of the AGW fantasy, they will consistently fail to point out any contrary view. Doesn’t matter that the contrary view might be correct ~ that’s an inconvenient truth they prefer to bury. This disgusting thing will happen tomorrow when Hansen takes center stage yet again before Congress. Supposedly he will call for the chief executives of large fossil fuel companies to be put on trial for high crimes against humanity and nature. I’ve even heard that he’s planning to actively engage in political activity against Congressional members not toeing the AGW line. Isn’t that a violation of the Hatch Act? Details, details. Every time I see another release of this nature from NOAA, NASA, NASA-GISS, etc., it simply destroys what little credibility they have remaining with me. A VERY serious question should be raised by those few career employees left at these government agencies: what will happen once the entire AGW charade comes crashing down and their funding all but evaporates? Nice point Tom Bruno. Building on flood plains and building levies makes the problem worse downstream. Somewhat like building your house six feet below sea level. Sooner or later, you will get wet. The levees can make matters much worse for the people living downstream. But that’s “somebody else’s problem”. Not to worry, Uncle Sam (that’s us, folks) will bail everyone out. Bow down (or bend over) to the high priests of global warming. You CAN be saved from all the bad things that are happening because of global warming. Sacrifice and donate at the altar of global warming. Only money, and lots of it, can save you. Amy Goodman, liberal columnist in our local newspaper has an article trying to link the floods to global warming. Details and comment at NC Media Watch. We can complain all we want !! But the truth is – these lies work. These lies get them more exposure, and get them more funding. Simple. We know they aren’t real scientists, they’re crooks. They know that we know. Do they care ? Nope, because they`re on a good thing. Crooks alawys think they can get away with it – otherwise they wouldnt be crooks !! And they have to start calling for them to be held criminally accountable for the funds they`ve fraudulently obtained, and to be held criminally accountable for the cost to our country and our communities from their lies. Just saw this on Drudge. You may be on his list too, Anthony. I wonder how much government subsidized flood insurance has to do with this? Aw, how great it is to live in the Mountain States. Only have snow in winter to REALLY worry about…and an occassionally entertaining thunderstorm. That’s about it though. It was the ABNORMALLY COLD air in the Western U.S., that lead to the significant rains in the Mid West. That contrast between abnormally cold and “heat wave” like heat in the East Coast that created such excessive floods. And abnormally cold air, which is a testament to this years cooler weather, is the first driving force. The terrain and location are the second point. In conclusion, it is an unfortunate situation to many people living out there…but what it isn’t cool to do is pull the “climate change card.” How utterly annoying and incorrect it is to pull ‘brownie points’ to gain PR value. But it is good to have opinion’s like this site…that share a similar viewpoint. One that is silently taking over internet America it seems. Cheers to common sense and scientists whom doubt like they should. Darn. Mr. Bruno beat me to it. I keep banging my head against the wall whenever people complain that their houses get flooded during the annual Summer floods along many of our rivers. There’s a reason many of the houses that DON’T flood are built on stilts— The owners had foresight and planning when they bought properties and BUILT HOUSES ON A FLOODPLAIN. Also, as Mr. Bruno points out, one of the major causes of the increased depths of the flooding in particular areas is the fact that levees force the rivers to “bottleneck”, instead of them flowing out over large areas in a relatively-benign “sheetflow” action. It appears that the people at NCDC & EDF are simply trying to score points by linking this entirely natural flooding to Glow Bull Worming™ and are attempting to curry favor with James Hansen and his pimps sugar daddies. Hansen is saying that deniers should be put on trial. As the planet cools, the alarmists are becoming ever more reaching in their attempts to keep us all on topic and ever more shrill in their attacks on those who point out the obvious. Hansen is now calling on congress to prosecute oil executives for bankrolling the truth. 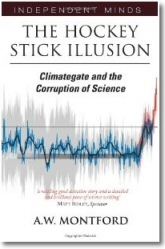 With their 100:1 advantage in funding, the AGW machine has failed to convince the public. They now believe the only way to shut up the truth is to put those speaking it in jail. They almost won last year, but the cooling since then has reinforced and encouraged those who speak out. People are beginning to listen. We can’t stop now. Keep up the good work Anthony! Given the level of stupidity in the country and the criminal negligence of the media, there is no way that idiots like Wang will have their feet put to the fire. There is no appreciable difference between Obama and McCain on energy or climate; each will pander to the constituencies they think will bring victory. The American public will lose in the bargain and one could say they/we deserve it for sticking their heads in the sand and occupying themselves with the activities of worthless Hollywood celebrities. A startling story in the news. If true. Hansen apparently is calling for the prosecution of oil CEOs who doubted AGW after his speech of 1988. They are to be charged with crimes against humanity? Lesser doubters will probably be attended to later. And he is forming, has formed, or is joining a political alliance to defeat those in Congress who haven’t voted correctly about AGW and energy matters. Will that list include the entire Senate which would not address Kyoto? We are about to see great drama, or great drama queens, actually both. Hansen can’t be ignored. His position is too important. If events develop as outlined AGW may get a better examination than ever before. That would be good. I can live with the facts no matter what they are. Nothing will be clarified on Sunday night. Tomorrow is another day. S.O. As an FYI, humans build things, generally, where they are needed or most useful. There are risks associated with building in ANY location. The balance lies in minimizing risk and loss. Last I checked, the flooding hasn’t affected large cities, which belies your suggestion that we “built lots of stuff” in the flood plain. To me, it mostly looks like farmland. Not to minimize the actual losses. My only point is to explain that your basic premise is false. There are no “safe” places to build. If you wanted to argue that certain locations aren’t worth the risk, but I think what you’re actually seeing is that highly populated areas are more protected and the less populated areas are actually part of the relief that protects the higher populated areas; in other words, a designed failure to minimize loss. Just a few stories ago on this blog we saw that although water vapour content has been decreasing in the upper levels, it has been increasing by much more in the lower levels of the atmosphere. More moisture in the atmosphere; flooding. Does it really seem ludicrous to suggest a link? On the issue of a short term drop of 0.643 degrees. I count 4 other cases on the above chart where temperatures temporarily dropped by at least 0.6 degrees. The biggest being the drop from the 1998 el nino of over 1.0 degrees. In each case the climate warmed again in following years…. The thing about levies, is that levies protect some of the best farmland in the U.S. on the Mississippi and MO river systems. Without those levies much of this ground would flood nearly every year, or 1 of 3, etc, rendering it unusable for agriculture. Yes, levies make the worst floods higher, but they allow a great deal of production from some of our very best farm ground. Without the levies and drainage, it would just be swamp. Millions upon millions of acres of swamp. Uncle Sam (that’s us, folks) will bail everyone out. First someone will have to bale them out. Maybe we should follow their lead. I would put out some money for lawyers if somebody savvier than I am in legal matters would start the show. If it’s a crime to shout “fire” in a crowded room, then what the Greenpeace and their ilk are doing is criminal, too. La Nina is the main cause of the flooding. Unseasonably cool SSTs across the North Pacific have shut off the flow of the mild/warmer Mp air to Alaska and Northwest Canada. This has allowed the generation of cold Cp airmasses to develope and move southward. The southern branch of the polar jet carried these cold fronts much farther south than if we were in an El Nino situation. Last year, as the La Nina developed, North Texas, Oklahoma and Missouri had periods of severe flooding as well. To say AGW caused this bout of flooding is absurd. How exactly do you think this land became “some of the best farmland in the U.S.” – flood plains are some of the most fertile places on the planet because flooding deposits nutrients. If you prevent flooding, you stop that cycle, the soil nutrients are eventually used up, and then have to be replaced with artificial fertilizers – at which point you might as well be farming anywhere. Snake Oil Executives. Both private and public including educational systems. Perpetual replacement of public infrastructure-private property guarantees is the billboard for foolish low IQ (not to be confused with todays Diploma Intelligence) planning. Both governmental and the citizen. This Uncle is called FEMA. Out of Control. A decade ago a local flood (central CA) victim was interviewed for TV. Victim was standing near his wet/flooded house. He said “No One Told Me That I Lived In a Flood Area” (my interpretation is HE wanted to get even with someone). I watched this spectacle of stupidity , including the TV crew, over the victims right shoulder 1/4 mi to his rear was what looked like a levee. I knew this Farm land that had been converted to a large subdivision. The off side of this levee is a significant river. California Guaranteed to burn houses down every year. Houses built in terrain-fuel that will kill firefighters (no way out) and a “politician” declares an Emergency, FEMA says OK here is the check. Over and over this has happened. In our own defense, this was a 500+ year flood. Building on a 500 year flood plain, is not that dumb of an idea. Having a 0.2% chance per year of getting flooded out is the kind of thing flood insurance is supposed to take care of. The houses and businesses that were totally wiped out, were down on the 100 year flood plain. If you want to claim that building on a flood plain is “stupid”, which flood plain are you talking about? 100 year? 500 year? 1000 year? Higher? Lower? Which? Smart man. I’m sure he would have had plenty to say about the whole AGW folly, and those espousing it; none of it flattering. The notion that it’s all lies is a good way to discourage people from giving the data a critical look, and helps polarize them, further disempowering them. The current administration has raised lying and misinformation to a high art, with the complicity and aid of the main streem media. Consider the sources, folks — doesn’t Hansen’s chain of command end at the White House? and, pofarmer, the occasional bad flood deposits lots of good silt that’s great for growing crops in. I expect yields to increase in the coming years. Well, they’ll have to, until we get off corn ethanol and use something else to make ethanol. I feel that the climate theories are just not explanatory enough. Global warming was such a discovery that we stopped looking for wider and different explanations for the extremities of the weather conditions. Before anyone goes off all this levee/flood plain stuff I’d like to make a few comments. First, the levees mean higher flood idea is a very dubious one. It’s quit a bit more complicated than the one villain assumption (sound familiar?). These things are not just plopped down randomly, there is some design involved. In general a levee will only slightly change the water surface elevation and not substantially modify the hydrograph. Second, a levee is designed for a maximum flood with a certain probability of occurring. In general, for economic reasons, non-federal or agricultural levees are designed for much lower floods. You pay your money and you take your chances. The media seems to be incapable of distinguishing between the two types. As for flood insurance, it’s not free. You have to buy it. The federal program was initiated because no insurance company will and to my knowledge ever has insured for water damage from a source external to the structure. If your external drainage pattern changes and you get water in your finished basement, you’re SOL as far as your homeowner’s insurance is concerned. Finally, it seems to me that for some time now a lot of this hype has been coming from the same people that support the AGW idea. Buyer beware. As in “stuff them into a hay baler” ? We have just the opposite occurring here in NE Oregon. People from out of the area have bought mountain side property and built wonderful modern log homes overlooking beautiful vistas. This winter, they saw nothing but snow and shoveled nothing but snow day in and day out. Many summer cabins further up were completely buried in snow. You could not tell there was anything but forest under that snow. All signs of human presence had vanished. These cabins are slowly being exposed, not as pristine as before, as the melting snow takes its time and toll. Another out-of-towner bought a little farm near the entrance to the Minam canyon area and erected a huge steel building with a cloth roof in front of the property. The cloth roof blew off when the occasional canyon-wind-sourced gigantic air hose did its thing. These people are now packing up and leaving, planting “for sale” signs on the leftover remnants of their once glorious dream homes. If you read the guts of the report, as opposed to the summary and press reports, you will find the pharse “substantially confirmed by intelligence data” repeated over and over and over again. The fact that public statements by most European intelligence agencies also came to the same conclusion is also apparently irrelevant. One of the reason’s why no company offers flood insurance is because it’s mighty hard to compete with a product that subsidized by the taxpayers. Not to mention the feds allow you to wait till the flood waters are practically at your door before buying it also makes a difference. It’s due to La Nina and Negative PDO – aka cooling. Don’t build in flood zones, don’t build in the mountains, don’t build in earthquake zones, don’t build in tsunami zones, don’t build in tornado zones, don’t build anywhere there might be a hurricane, a snowstorm, rainstorm, a windstorm, a hailstorm, or a drought. That eliminates most of the planet! Maybe we can all move to a glass bubble on the moon. Oops, that’s a depleted oxygen zone! Come on, people, get a life. Global Climate Change — it’s not a new thing. The weather’s been changing for billions of years, and somehow we’ve managed to survive. Quit running scared from the weather and learn to live with it. It’s here, it’s going to continue happenning, and there ain’t a thing we can do to change that. Personally, I’ll risk living out in the weather rather than living in a concrete bunker with it’s own smog cloud and piped in traffic noises. People build in bad places, I agree, but before you throw everyone under the bus on this one, some of the flooding that happened this year had never been seen in recorded history. This is especially the case for Cedar Rapids, IA, where the USGS/NWS had to install a temporary river gage just to measure the stage because it was so far beyond anything expected. Mostly people have been talking about 500 year or 0.2% probability events. However, places that got flooded in 1993 (100+ year plain depending on the watershed) where new buildings were erected on is certainly within the boundaries of “stupid”. I bet we could go around the country and name quite a few cities that have a 0.2% probability in any given year of far greater destruction, to name a few: all of the CA cities near the San Andreas for sure… Seattle (Mt. Rainier is maybe <0.2%)… all of the Gulf and Southern Atlantic cities… we might even put places like Memphis on the list due to the seismic hazard. Actually in the Iowa press there has been seemingly very little discussion of AGW except for the passing comment that we might see more of these in the future, but certainly not much of the AGW caused this destruction at the local level. I don’t know about what the national U.S. and British rags are saying, but Iowans like myself are usually pretty skeptical that international news sources could even locate the affected places on a map after being given one, let alone get any news reporting right. That said, the big push in the opinion pages this weekend was about the contribution of increasingly intense farming practices as a contributor to the severity of the flooding. This makes sense because the vast majority of the contributing drainage areas is farmland used to grow commodity corn and soybeans, and newer ethanol incentives have given more incentive to remove conservation practices that slow down water. Now that sure how smart some in the miltiatry are, like shipping nukes to Tawian without knowing it. Wouldn’t it amke a little more sense to say it caused them to frezze and crack and then when they thawed out they were weaker? Here in Iowa, freezing during winter is normal. Here in Cedar Rapids we typically have a week or more where temperatures don’t rise above single digits F.
If you prevent flooding, you stop that cycle, the soil nutrients are eventually used up, and then have to be replaced with artificial fertilizers – at which point you might as well be farming anywhere. and, pofarmer, the occasional bad flood deposits lots of good silt that’s great for growing crops in. I take it you guys have never farmed in a river bottom? Ever seen them with a 6 foot tall plow turning under tons of sand? Ever seen the sinkholes left? Over a hundred year time period what you say is true. In the shorter term, you can’d do anything with FEET of silt. In the days of the Egyptians maybe the yearly deposits were neccessary, today we can take advantage of the unique advantages of these soils without the disadvantages of having them constantly flooded. Modern agriculture depends on modern production methods and dealing with semi annual floods isn’t helpful. it was pretty obvious there would be flooding back in March, given the winter and spring that occured. It’s pretty darn stupid to blame AGW. Now that sure how smart some in the miltiatry are, like shipping nukes to Tawian without knowing it. Well, in this case the guy is probably correct. Those levies are mainly sand with a clay core, and they can get waterlogged. You can all bury your heads in the sand if you want to. But weather on earth will continue to get more severe and the sea levels will rise. Have you even acknowledged that carbon dioxide levels have gone from 280 ppm in 1957 to 380 ppm today? Have you acknowledged that carbon dioxide levels are rising at the alarming rate of 2 ppm per YEAR! And do you acknowledge that carbon dioxide works to trap heat at the surface of the planet? If not my friends, then you are sadly mistaken. Get off your right wing agendas and WAKE UP! REPLY: Hello Steve, thank you for your comment. Just a suggestion, why not read up a little bit at some of the other things we have posted here before making unwarranted blanket accusations? We have several post on Carbon Dioxide, we also have several posts on the supposed increases in severe weather, which amazingly, show the opposite of what you profess. Hurricane frequency has decreased, the link with AGW broken. The number of F2-F5 tornados has not followed predictions of increases either, though we have better reporting. Sorry but I just can’t consider your comment seriously as posted. It’s mostly a rant using stereotypical information. Read up. Also I think you’ll find some libs and dems that read and participate in this blog also. If you look at the long-term trends in our weather. I’m talking about 4 decades or more, then I think you will find that severe storms have been on the increase globally. You can’t ignore the fact that the hottest years on record have all been in the last decade or so either. Short term trends mean nothing. The sad truth is that human activity is pouring greenhouse gases into the atmosphere. And that those gases work to increase the temperature at the surface of the earth. This blog is devoted to ignoring those facts. I don’t know for what purpose. I suspect that people who derive their living from producing greenhouse gases would love this sort of propaganda. See the report for yourself. “The number of F2-F5 tornados has not followed predictions of increases either, though we have better reporting.” But hasn’t this year been one of the worst for tornadoes? Sorry, Norm, but that report only talks about “what ifs”, not definites. There’s zero evidence that weather events have become more extreme or more frequent over the last century. The busiest North Atlantic Hurricane season on record is still in the late 1800s, even with all our advanced detection techniques and naming of storms which wouldn’t have been named, or even detected, 50 years ago. If you look back and the last 3 years’ predictions of hurricane seasons (how dismally they failed to predict), and still believe that report, well, all I can say is I hope the Kool-Aid tasted good. Show me some observational proof, not output from computer models. So Jeff I suppose that predictions by NOAA, which can’t be verified by “observational proof” (because they are predictions of the future) don’t hold any water with you? I guess computer models aren’t to be trusted in your world. Well my friend let’s just see what the next ten years has in store for the good ol’ U.S. of A. Talk to me ten years from now when crops have failed and massive storms have devastated the country. You can observe that. Look at last years hurricane predictions and get back to me. Anthony, I don’t agree that there is no link between tropicalstorm intensity and global warming, increased temperatures would also increase wind (which also cools SST). This wind shear can ‘kill’ off hurricanes before they get started as happened a few times last year. Well, then, simply provide some scientific proof of observed warming causing more and powerful hurricanes and you’ll be a rich man. So far the evidence hasn’t materialized, except in computer models. And a bunch of storms made it up to hurricane status for just a day and faded away. Don’t forget that some of last year’s “problems” were due to Saharan dust. Sun would warm the air, not the ocean, so SSTs were depressed and the atmosphere more stable. I don’t know if that’s repeating this year. Atlantic hurricanes are an awful, awful thing to try to correlate with global warming. The big increase starting with 1995 has much more in common with busy periods in the 1950s and 1930s. It will be interesting to see what happens now that the Pacific Decadal Oscillation has flipped negative. That will bring more La Ninas, and those tend to have less windshear. Yes, but it’s not like 1974, is it? A Google search for tornado 1974 reports over two million pages. 1974 was during the last negative PDO phase, so it’s not too surprising that this year has a lot of tornadoes. Do you remember the winter of 75/76 when the Ohio River froze and coal barges couldn’t deliver coal to Ohio power stations? Industry and schools shutdown for a couple weeks, although Amish schools stayed open. How about Boston harbor freezing over? That hasn’t happened recently. Norm, they’ve been making the same predictions for 30 years now, and none of it has come to pass. So no, they don’t hold any water with me. It’s like the Doomsday predictors. Their predictions fail, so they make up new ones. Oddly, they can’t provide anything solid, it’s always a nebulous “likely”, “may”, “could”, etc, ad nauseum. The models aren’t to be trusted as predictive devices, period. They can be used to test hypotheses, but should never be used as a valid source of data, since there’s no way the climate can be accurately modeled with the knowledge we currently have. For the same reason an aircraft manufacturer wouldn’t fly a plane without wind tunnel testing first, as opposed to simply relying on aerodynamic modeling programs. How about this, Norm. Pretend we’re ten years ago and you had said the above. No net waming during that time. Unpredictable hurricanes seasons (abnormally low), now a cold snap across much of the NH. Would you still expect me to keep waiting for something that clearly isn’t happening? Sorry, I have a brain. Sure, ONE of the worst, not necessarily THE worst. So nothing unprecedented has occurred. When was the last one? Right around the last PDO shift in the mid-late 70s. So, it would seem the temperature differences meeting in the middle of the country are what cause these supercell storms, and not global warming. They’ll happen when it’s cool just as they will when it’s warm. Also, we’ve been keeping track of these things an extremely short time, and can detect them better now than even 20 years ago. I’d bet, but can’t prove, that there were worse outbreaks that no one ever saw, before there were methods to detect them without being there. Sure they are, its just GCMs (Global Climate Models) that we don’t trust. Show me one that handles clouds well and it might be worth paying attention to. It would help if models were initialized with real weather data so they’d have a believable starting point, though that’s a bit of a cheap shot, I’m sure you’d agree. And of course, the controversy about the climate forcing ratio GCMs use needs much more study. It’s not just a USA problem – we have only 3% or so of the Earth’s surface, so the planet as a whole has about 33X our problems. overall, we’re much worse prepared for global cooling than resumed warming. Spend some time here reading, you really need to learn more about the big picture and this is about the best place in the English speaking world to learn. I agree with a lot you say Ric, I was just making the point that last years Hurricane season was extra-ordinary. A number of storms each year make hurricane status for a day before weakening every year, that is not unusual, but the events I described have not happened before. Global warming CM’s predicted a greater probability of extreme weather events and this year has been no exception as you in North America have been experiencing, you can’t take any one event in isolation but put them together….. This year could be an extreme year for Hurricanes, SST’s of the west coast of Africa are 2-3 degrees above normal and dust levels are normal. The -ve PDO should result in less wind shear so more storms should develop, I hope I,m wrong though. plenty of surface water…and will the camera soon sink! I’m sure you are well-intended but I URGE you to read this summary of what the report actually says: http://sciencepolicy.colorado.edu/prometheus/archives/climate_change/001462what_the_ccsp_extrem.html#comments . The report’s science is nothing like the press release or the press coverage. Now, go look at the temperature graphs posted nearby. Again, I will say referring to the present time: “What warming”? Pingback: Earth begins to kill people for changing its climate « Watts Up With That? I stopped reading this after awhile because of the flawed science and thinking involved. I give you props for actually taking the time and brainpower to try and debunk global warming. It’s good to have opposition and constant willingness to make scientists prove their theories with evidence and explain themselves better. That’s what science is all about. I find it interesting, though, that you’re actually a “certified” meteorologist. Where you got your certification remains unknown but my guess is that it wasn’t from a top research institution (or top anything, for that matter). Global warming is somewhat of a misnomer. The average GLOBAL temperature is expected to increase by a degree or two (ºC) in the next century. However, not every place on the planet is going to experience warming. The term conservatives like to use, “global climate change” is better suited. In relation to what you’re talking about… there is good evidence which shows the Midwest has experienced (over the last 100 years) an OVERALL increase in precipitation along with an overall increase in temperature. Furthermore, there has been an increase in 1-day rainfall events that equaled or exceeded 2 inches. Yes, there are areas that have experienced a decrease of these extreme rainfall events but again, the overall trend is increasing. I would explain more but unfortunately I have my own research to do (which is the reason I stumbled upon this post in the first place). Cop-out? Sure, you can call it that, but I think your underlying knowledge of weather and climate is not up to snuff. But that’s just what my “liberal education” is telling me. In order to become a CCM (in the early 80’s when I achieved certification), one must have had at least a bachelor’s degree in meteorology, five years or more of experience in applied meteorology, character references, pass an open book examination in applied meteorology, write a meteorological paper, pass a closed book meteorology test and pass an oral examination by the CCM board. After all of that, your name was published and anyone had 90 days to object to your certification as a consulting meteorologist. I hold CCM certificate #364. I have been honored with the Society’s Award for Outstanding Contribution to the Advance of Applied Meteorology, which can be seen here: http://www.ametsoc.org/awards/index.html#past . This is not what I was talking about at all. Certain agencies (including NOAA, which should know better) were attributing this particular flood to global warming. My piece debunked that. I made no comment, one way or another, regarding the climatology of heavy rainfalls in the Midwest. Just came across this posting and decided to link to it (belatedly, but it’s still timely). Thanks.